For the Love of Strays is a volunteer, foster based rescue 502(c)3 group here in Corpus Christi. They work at saving as many dogs as possible from the streets and alleys. For example, if you find a stray dog on the street you can contact them and they will do their best to find it a foster home or a permanent home. They also take dogs from city animal control when they are on the list to be euthanized when they have space. When a dog comes into their program they are fully vetted, treated for any medical issues they may have, spayed/neutered. vaccinated, micro-chipped and placed in a foster home where they learn or re-learn to be social, learn some basic indoor doggy manners, their temperament is discovered, etc. 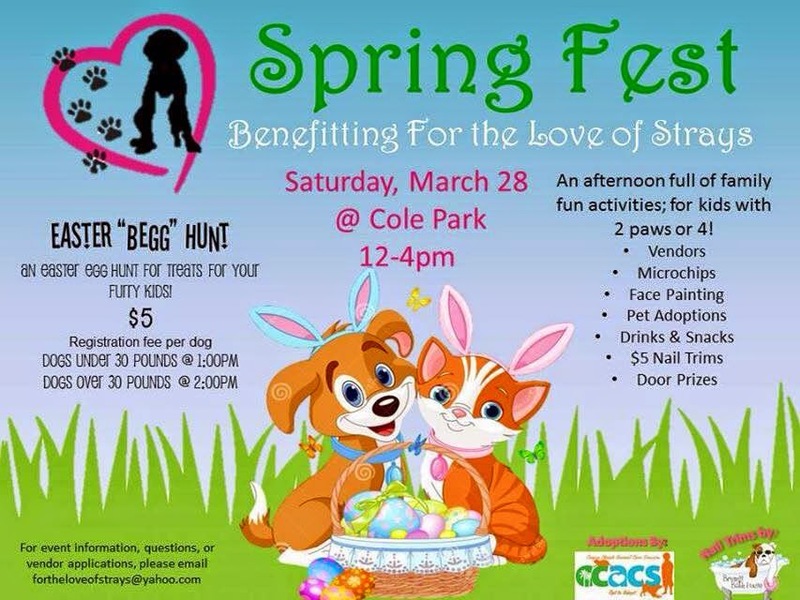 Events such as Spring Fest are one of several ways they raise money so that they can continue to save and care for the dogs that come into their program. For the Love of Strays relies solely on what they can raise through events such as this, adoption fees help to recover some of the costs spent on the animals, donations from the public, online auction a few times a year, and on those few grants that they can find and be eligible for. Not only do they provide vet care and spay/neuter they also provide everything that a dog will need while in foster care, food, toys, beds, crates, treats, collars and leashes, etc. They offer them for adoption by using the internet, events such as Spring Fest, and every weekend they are at Petsmart and other places as invited. They also educate the public at any opportunity given about the importance of spay and neuter so our population of unwanted and abandoned dogs decreases on our streets. They are limited in their efforts to save the dogs by the number of foster homes available, so if any of you would like to learn more about fostering they can go to their website. Spring Fest they will have several events for people to show off their dogs, even an Easter egg hunt for them. Since this is a family event they also offer things for kids to do and see! So come out for some family fun and support this amazing organization!